It’s One Room Challenge time! I’m so excited to be linking up with Linda for this round of ORC fun. In the past I’ve worked on my laundry room, master bathroom, dining room and guest bedroom. 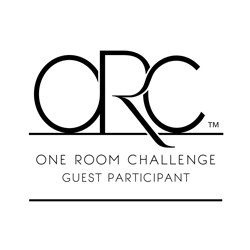 Honestly, none of those rooms would be even close to complete if I hadn’t joined the challenge, so a huge thanks to Linda for hosting every year! This year I’m cheating a bit. 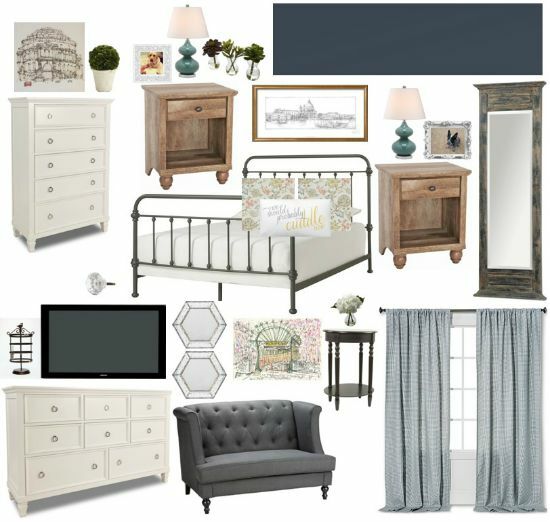 I’ve picked the master bedroom for this round even though I’ve already started on it. I have so many unfinished rooms that I don’t really want to start working on another room before finishing one I’ve already started. Plus joining the challenge is probably the only way it’ll ever get finished. It’s so much better than before, but is still missing some furniture and anything decorative. So although I have a big head start on this challenge, there’s still plenty left to do to finish this room. With that, let’s take a look at the mood board I put together for the room. Obviously everything is subject to change, but this is the general direction I’m heading. As I mentioned earlier, I’ve already bought a new bed and nightstands, but I still need a pair of dressers and either a pair of chairs or chaise lounge for the sitting area. Everything else is just accessories and finishing touches, but those usually take me the longest to find. So with that, here’s my to-do list for the challenge. I’m sure I’m forgetting something and will need to update it next week. Don’t forget to check out the official participants here and the other linking participants here! I’m so excited to see some of these rooms come together over the next six weeks! Gorgeous mood board! And I really love your wall color and bed. Gorgeous paint color! Can't wait to see the finished space! It's going to be sooo pretty! Looking forward to following along on the transformation! I love the mood board! I feel like all my rooms are lacking decorations. Can't wait to see the final change!